What if, for you, it’s actually NOT the most wonderful time of year? What if it’s your first Christmas (or your 51st) without your beloved? What if you’re fighting physical, mental, or emotional illness? Or what if you are so financially strapped that every holiday message just seems to remind you of what you are not able to buy for your loved ones? In the United States, we put high expectations on each other during the holidays. The truth is, if you don’t watch out, if you do in fact pout, you’ll be labeled Ebenezer Scrooge faster than you can say, “Falalalala.” Indeed, our culture demands that we be jolly, happy souls, listening for sleigh bells and roasting chesnuts. Exhausting! It’s true. For some, Christmas cheer is taxing rather than encouraging, no matter how genuine the well-wisher may be. Each year, I know people for whom the season is difficult; but this year, the holiday blues seem a lot more common. Maybe the pervasive commercialism of the US is wearing on folks; maybe 24-hour news is not such a good idea after all, what with the incessant reports of violence and tragedy. 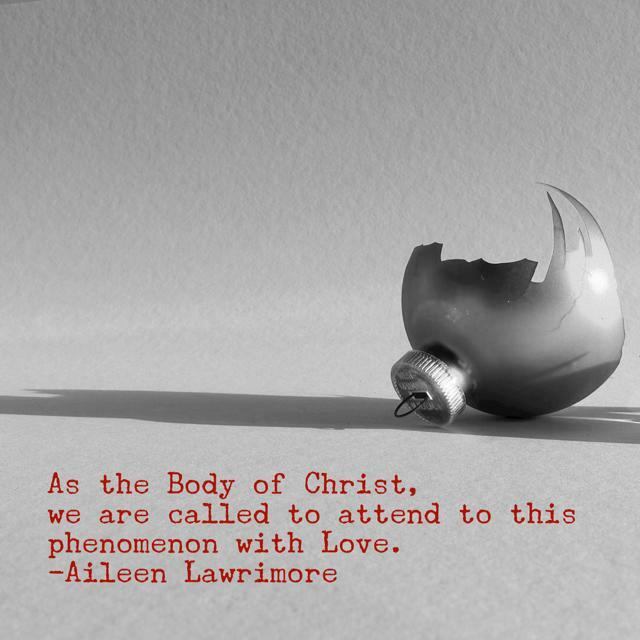 Whatever the reason, as the Body of Christ, we are called to attend to this phenomenon with the love of God. So how do we do this? There are many ways, but here are a few I find helpful. If you know someone who has lost a loved one—especially in the last 12 months—know that pain is not increased when the dearly departed is mentioned. The reverse is actually true: people who are grieving often fear that you and everyone else have forgotten the person who meant so much to them. By remembering, you offer momentary comfort. So mention the deceased by name; maybe even share a personal memory or two. Your thoughtfulness will be a blessing to the bereaved. Remember that grief doesn’t expire. For the fatherless child or the childless mother; for the brother who no longer has a sister, the friend missing a trusted confidant, the wife who never wanted to be a widow . . . heartache never misses a holiday. The good news is that comfort can be new every morning. Send a note, make a visit, or turn a chance encounter into an opportunity to reminisce about the one who has died. To the person grappling with grief, your words will be a welcome reminder that they are not alone. Blessed with an overabundance of Christmas cheer? Consider taking up the slack for someone who can’t seem to muster up any of their own. It is difficult to deck the halls or bring figgy puddings when coping with illness or caring for someone who is. Help decorate, bake a meal, run an errand, do a chore. But, and this is key, don’t expect people to ask you for this help or even to accept it at first. Just be persistent and determined. Your efforts matter. Know people with financial difficulties? You don’t have to be insulting or judgmental in order to offer real help. Slip an anonymous gift card into their Bible or other belongings. Do they have children? Offer to babysit. Like to cook (or pick up take-out)? Deliver a meal and be sure to take enough so leftovers can stretch one meal into two. But be a friend, not a rescue worker. Nobody wants to be a project. Most importantly, watch your language. Avoid platitudes like, “Cheer up! It’s Christmas!” No one has ever responded to such advice by saying, “Well okay! Thanks so much for telling me that! I’ll cheer right up now!” Likewise, the statement, “There are plenty of people who have it worse than you.” I mean, so what? That reality doesn’t alter the pain being experienced in the moment. Validate the speaker with words of support and understanding, not nagging criticism and worthless advice. Don’t expect a complete and instant turnaround. Healing takes time; you may not see any evidence that your ministry has been a blessing. Trust God. Your gifts will draw interest over time. *This piece was first published on December 14 by Baptist News Global. I’m delighted to be associated with this great organization and am honored to be among the writers and thinkers featured there. Watch for my BNG column, appearing monthly at baptistnews.com. GREAT thoughts and VERY APPROPRIATE...so very true....I am very aware of such people as you write about and praying so for those who are not "joyful and happy" in their situation at this Christmas time. I think I read some of YOUR MOTHER in that article....and I am proud to be "quoted" in this way. I am very proud of you...love you much, your mother.